Chrysler CL Series complete Workshop Manual includes Books 1-4 plus the Electronic Lean Burn Ignition System Training Manual is the most comprehensive workshop manual available for the Chrysler Valiant CL Series. Suitable for the home workshop mechanic or professional technician, this manual will help you maintain, repair and restore your Chrysler Valiant CL. Very easy step by step instructions with lots of diagrams. 4.0L (245 cu in) Low Compression 6 cyl. 4.0L (245 cu in) 6 cyl. 4.3L (265 cu in) 6 cyl. 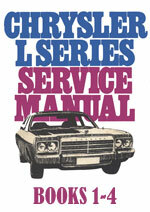 Chrysler Valiant CL Series Workshop Repair Manual $24.99 Immediate Download!